Reinstall iPhone/iPad: Erase All or Selectively Erase Data? Reinstall iPhone/iPad: Erase All Data or Selectively Erase Data? Reinstalling iPhone or Restoring iPhone is a common thing done by various iPhone users. There are a number of reasons as to why it becomes important to reinstall iPhone. Primarily, it is either because your iPhone has stopped working or that you want to improve the iOS performance. In any case, here you will find some of the methods that you can use to erase iPhone data or reinstall iOS in a convenient manner. The method that you use will depend upon the requirements that you may have. If you simply want to do a light reinstall, you may as well try iTunes. However, if you are looking for something more robust, then a specialized software might be more beneficial. This method is for those who want a light clean install with only a simple data removal instead of a permanent iOS data erasure. Once restored, the data will automatically be removed from iPhone. Follow the steps below to restore iPhone using iTunes. Step 1: Connect your device to the computer and open iTunes. Step 2: Enter your password and follow the prompts on the screen. Step 3: Click on your device in iTunes. 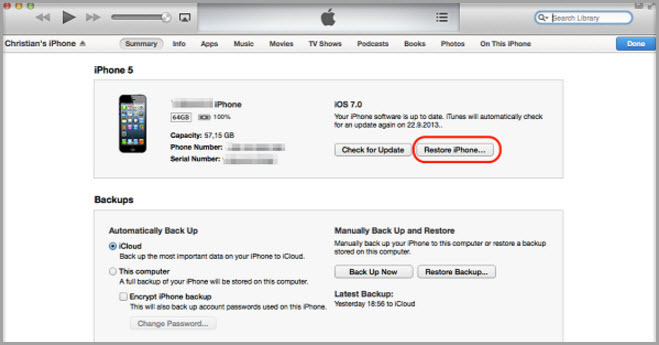 Step 4: Click “Restore iPhone” in the Summary Panel. Step 5: Click “Restore” again to confirm. Your device will restart once it has been restored. As mentioned earlier, restoring iPhone using iTunes is only suitable when you want a light clean install. This means you do not want to permanently erase iOS data to make it unrecoverable (the data deleted by iTunes can be easily recovered with the data recovery software). In order to perform a complete deep install, you may need a software application. 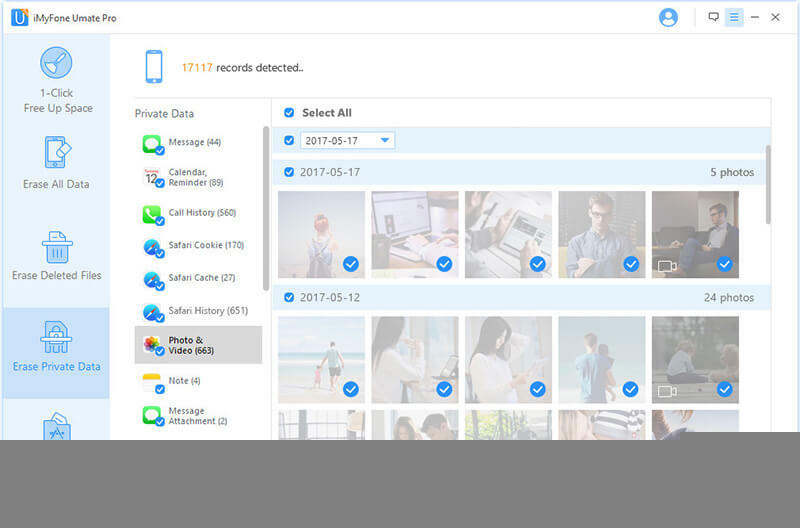 iMyFone Umate Pro or iMyFone Umate Pro for Mac is one such application that will erase all your data in one go. 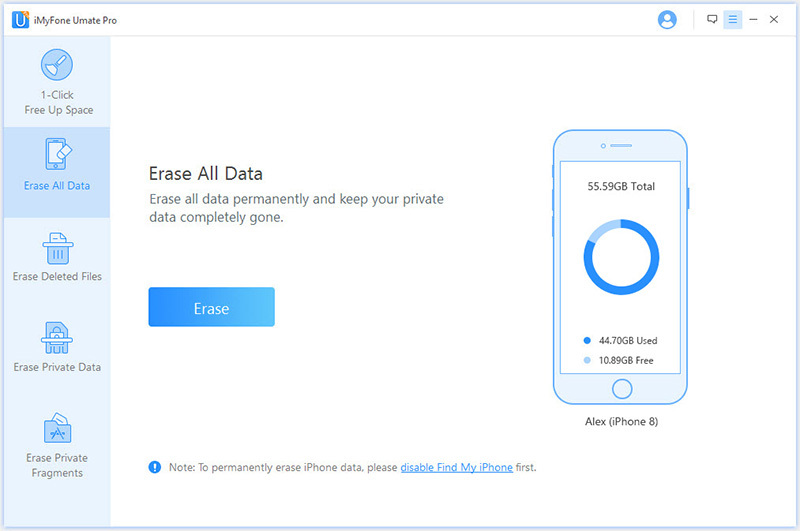 Using the “Erase All” feature, iMyFone Umate Pro allows you remove all information from your device within no time. Follow the simple steps outlined below to carry out a deep clean process. Step 1: Connect your device to the computer and launch iMyFone Umate Pro. 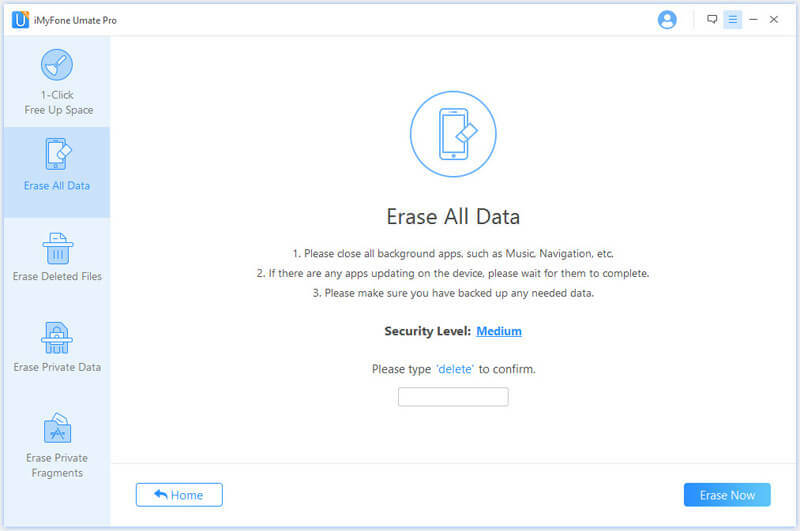 Step 2: Once your device has been detected, select the “Erase All Data” feature from the options. Step 3: Click “Erase Now” to begin the process of reinstalling your iPhone/iPad. iMyFone Umate Pro offers more security as the files erased using the application are 100% unrecoverable. You may also remove files that have already been deleted. This is because the files that you normally delete can be retrieved using various data recovery software. As such, iMyFone’s “Erase Deleted files” option lets you erase such files from the system permanently. Upgrading your iPhone can seemingly be an easy process. However, it is vital that before you can upgrade your iOS, that you back up all your files and then wipe your iDevice completely or at least erase the files that may cause trouble during the upgrade. This ensures that your privacy is not tampered due to the upgrade and your files remain intact in your computer rather than on your iDevice. Furthermore, deleting redundant files frees up extra space for the upgraded software. As such, you can enjoy the new iOS without experiencing any performance glitches. Nevertheless, there are not many applications that allow you to delete files individually. iMyFone Umate Pro is one of those tools that let you select the files that you want to delete. You can follow the steps outlined below to reinstall iPhone and and selectively erase files. 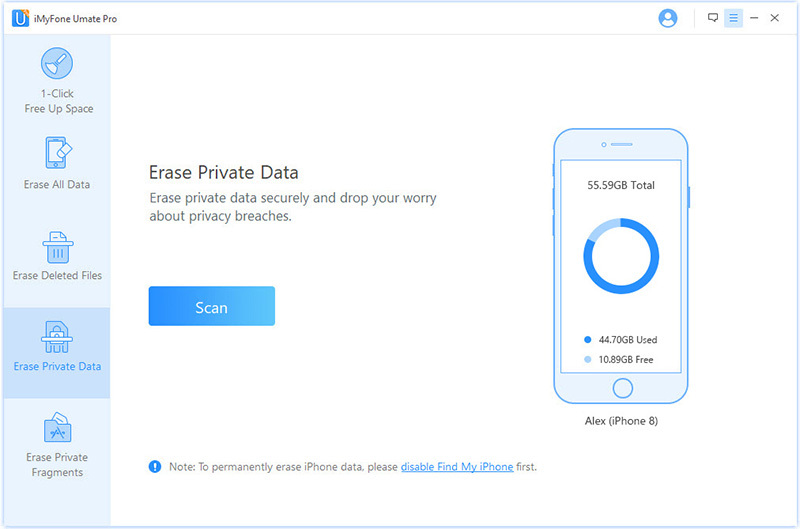 Step 1: After your device has been connected to iMyFone Umate Pro, click “Erase Private Data”. iMyFone will start scanning your device for private files. Step 2: Once scan is complete, all the files will be displayed for you to select. Select the files you want to delete and click ‘Erase Now’. Step 3: Type in ‘delete’ to confirm and click ‘Erase Now’. Step 4: After the files have been removed, remove your device from the computer and go to Settings on your iDevice. Step 5: Tap on General and go to ‘Software Update’. Step 6: If an update is available, tap “Download”. Tap “Install” once the download is finished.